Hello everyone.. ;D Last day of the May. Hopefully everyone is doing awesome. Today I will be showing you how to get a more define oblique . 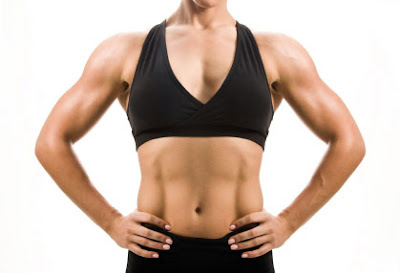 You're probably wondering, what is obliques? Did you know that your abdominal area are separated into different section? There is your upper abs, middle abs, lower abs and then your obliques.. (i don't want to go into too detail) Will just show you a picture of my obliques..
That line at the side of your 6 pack should be it.. haha ! my 6 pack is currently not available ! hahaha.. I won't lie to you but this is my morning stomach, when at night it will be slightly bloated ! 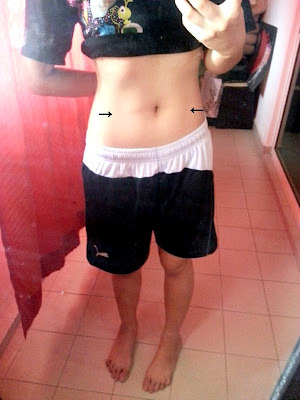 Still working every hard to tone that tummy.. ( not easy, okay !) hahaha.. This is another better and more obvious example..
*got it from the net.. This workout is not really hard, but i won't say it's very easy.. By working out, you're able to get that slim and tone body that you can maintain, Where else slimming pills are only temporarily.. (For some pills, when you stop consuming you might even gain 2x the weight you loss..) So don't be lazy, work for it, once you have it you won't regret it.. *True story ! hahhaha.. Anyways, running off topic. Getting back to the exercise.. It sort of a lazy's man exercise ! you don't need any equipment..
Pls ignore my crappy facial expression.. I just woke up. Raise you knee to reach your elbow, Some people are not so flexible, it's okay. You can just bring it to half way.. & then do the same thing on the other side. please do not do one shot 100 reps.. You will have a tough time getting up the next day. If any question or anything you want me to post up on my blog, please inbox me on Facebook.